I get a fair number of enquiries through the website, since I am ranking pretty well on Google. But there’s always a few that are just phishing enquiries from other photographers trying to find out more about my pricing and licensing structure. Heck, I might have been tempted to do the same if I didn’t know the market very well and I was just starting out, but having worked for many years and done more than a little research and water testing, I’ve got a pretty good handle on what my market will handle and of course what I need to keep my head above water. What I find a little disappointing is rather than picking up the phone and asking me directly, (which by the way, I done myself and have some good results and made some photography friends from) they try to con you into giving them a quote by pretending to have work for you. After seeing a good few of these, I thought I’d list a few pointers to help you spot the fakes and time wasters. Lets take this recent email as an example. This referral came through from the charges and licensing pages on my web site which goes into some of the costs of commissioning my work, so I know the person emailing has seen my general prices. Great. Within the body of the email the sender, doesn’t mention a company name or includes a contact telephone number to follow up the conversation with. Again nothing wrong with that, but I usually like to Google the company to get an idea of the size , the sort of work they do and whether they have a good set of images they use already. It’s just good business practice to do a little research on who you might be working for. I’ve done research like this before and found posts that have warned me to steer clear of working for company X as they very rarely pay. Definitely worth a 1 min research. Apart from the initial enquiry being pretty vague. 6 offices, two locations, not quite mentioning and what sort of work they’re after. Interior, exteriors, corporate portraits, construction phased work, 360 photography? 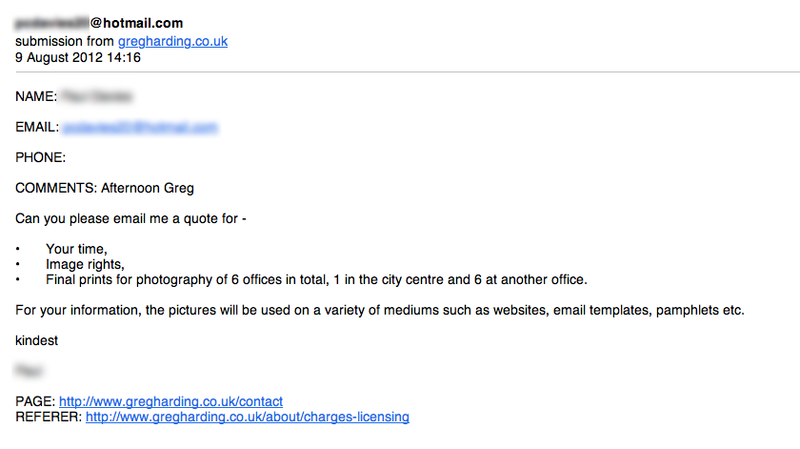 Anyway moving past this, the sender obviously knows what they want to use them for and they mention the image rights. Great. But hang on, this looks like they know much more than they’re letting on. How can you know exactly what you want me license the work for, but be vague about the actual work? Hmmm. Something’s not right here. Here’s a quick tip and it’s amazing how many times this works. Copy the senders email address and paste it into Facebook (other social media platforms are available). Voilà! Amazingly, or not so amazing actually, this email address is linked to a Facebook profile for a photographer. Caught you. Of course not all email enquiries are bogus, but if it looks suspicious it probably is and it’s a shame if you’ve spent a while trying to price it correctly for them only for the whole thing to be bogus. In my experience if people genuinely want to work with you, they’ll provide as much detail as needed to give you the tools to quote accurately, including providing a contact telephone number and company website. However if you are a photographer and you want advice or you want to chat with other photographers about how to price and license your work, just call or email direct and ask if they could spare a few moments to chat to them. The worst that can happen is we say no.